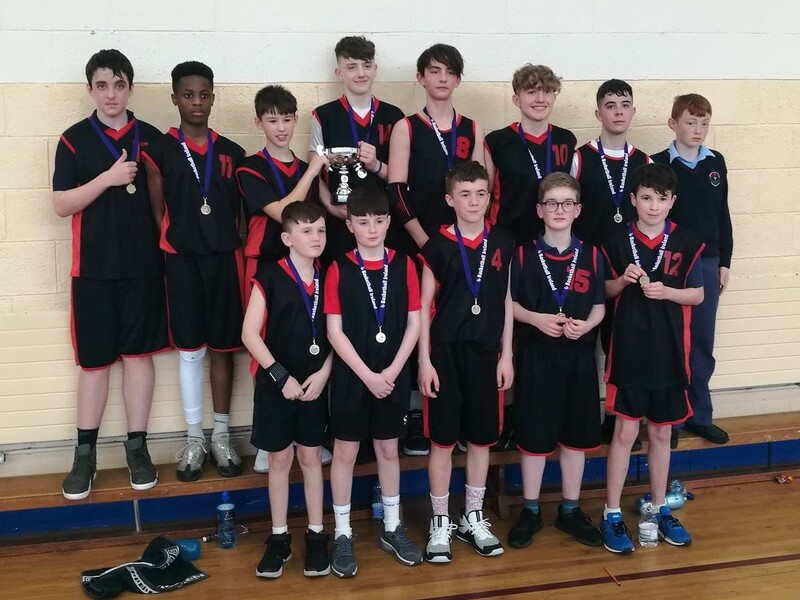 The First and Second Year Boys basketball teams competed this week in the South East School’s Region League Finals. Both teams have worked extremely hard throughout the year and have shown tremendous dedication. The First Year Boys were successful in beating St Kieran’s College of Kilkenny, bringing home the gold medal. The Second Year team lost a close final to St. Peter’s Wexford. Both teams are now moving on to the All-Ireland playoffs and will be hoping to gain a spot in the next round and move one-step closer to an All-Ireland Title. Thanks to Mr Homan for all the coaching and mentoring of the team. The team travelled to Dublin on Friday 12 April not knowing what a day lay ahead of them. First up was the quarter final against the very talented St Michael’s Listowel. After a great opening quarter, the game became a tight and cagey affair with no more than a basket or two separating the sides. However after a solid defensive second half the team took the win. The semi-final was played an hour and a half later versus an equally competitive Mohill CC. The team had to rest, regroup and go at it again. This time the team started slowly and trailed by six points in opening quarter. The boys worked hard throughout the rest of the game and thanks to the heroics of Jack Kehoe and his teammates behind him, the boys managed to tie the game at the end of regular time and end up going to overtime. In overtime once again Jack and his teammates stepped up to run out eventual winners. The team now plays St Michael’s College Ballsbridge in the final, which they are really looking forward to. This will take place in the National Basketball Arena on Friday 3 May. The boys would like to thank Mr Murray and all their teachers for their support over the campaign and will try their very best in the final. 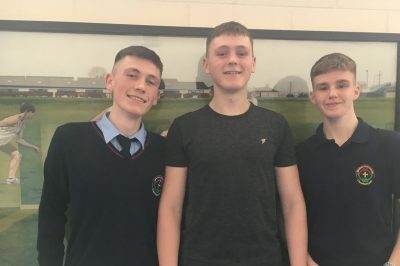 Members from our Senior Boys Rugby Team formed a 7-a-side team to participate in a Carlow rugby blitz on Friday 22 March in Carlow Rugby Club. 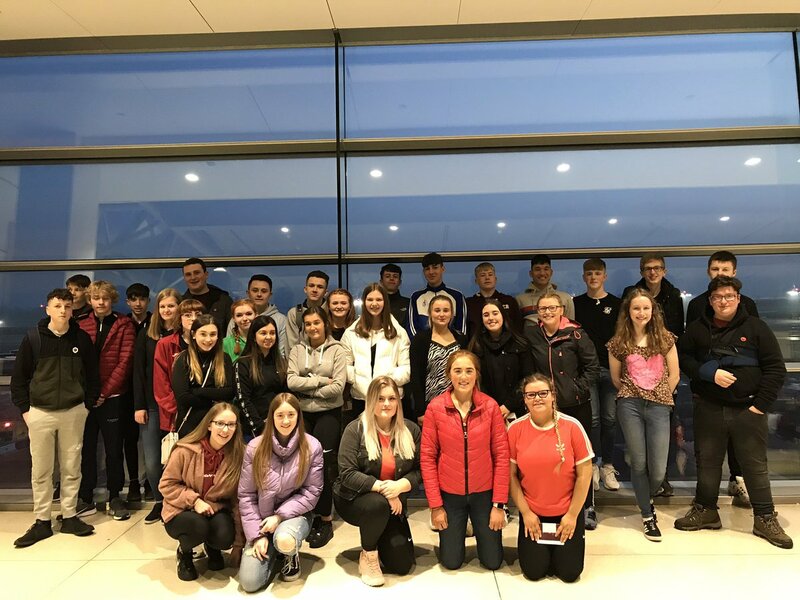 The team included Paddy Rogers, Cormac Mc Elligott, Padraig Thompson, Conor Duffy, Ross Mannion, Mikey Dowling, Luke Drought, Daniel Breen and Jack Williams. The boys won three of the four games they played including beating two CBS teams. Three girls represented the school by joining with Gaelcolaiste Ceatharlach. They were Lizzy Rogers, Amy Nolan Swayne and Katie Williams. 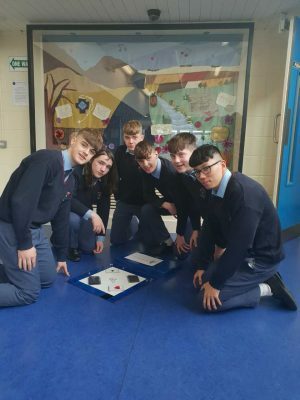 The students enjoyed the blitz and playing with their friends from the Gaelcholaiste. Last year our Camogie team won a set of Jerseys. 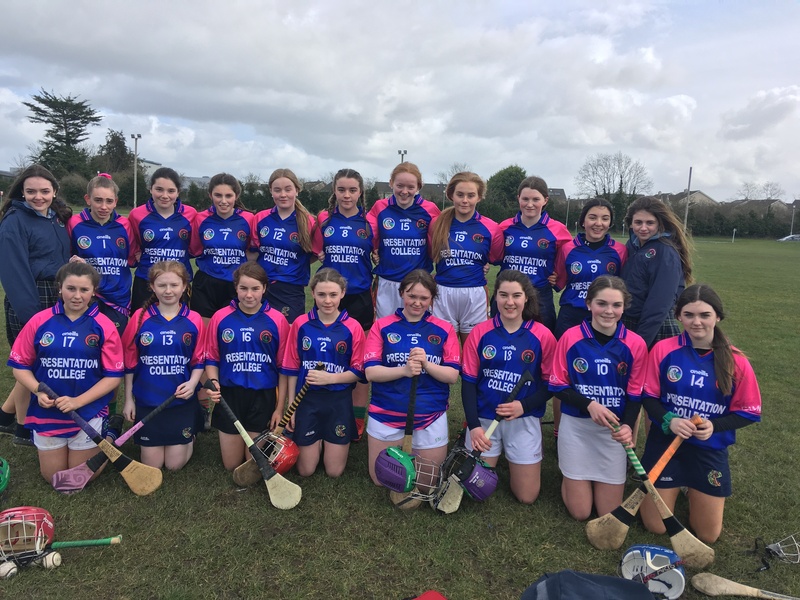 This was due to their success in the ‘Leinster School Junior Novice Camogie Development League’. 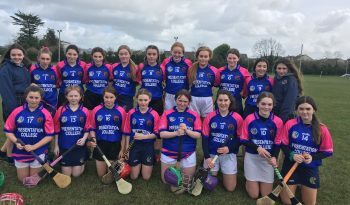 We join with Gaelcholaiste Ceatherlach for Camogie and there are girls from both schools in the photo. 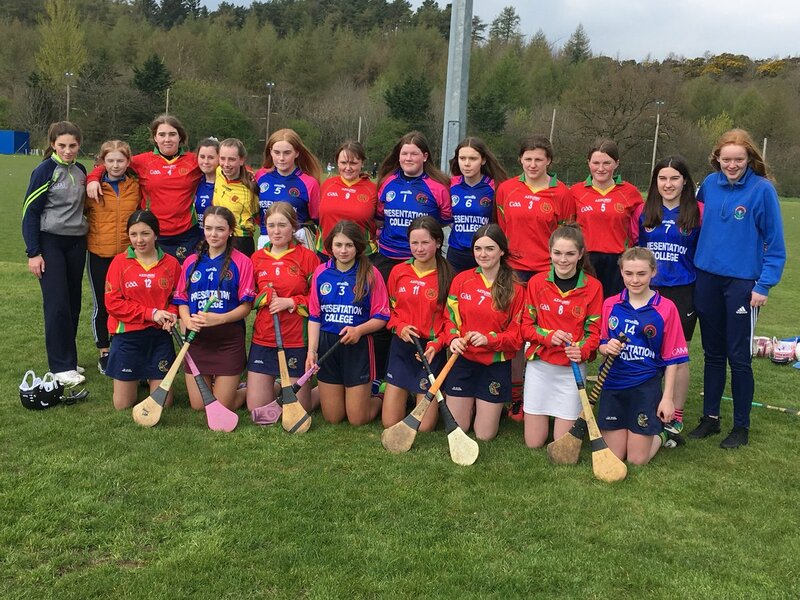 The combined forces of The Presentation College and The Gaelcholaiste are proving to be a formidable outfit on the Carlow schools hurling scene as they swept all before them at the recent Domhnall English-Hayden Memorial Tournament at the Fenagh GAA grounds. As the end of March seems to have swapped with the end May, all involved were excited for a day of hurling in Mediterranean conditions. The tournament was played under the Fenway classic rules, which comprises of a shortened pitch and 11 players on each team. It requires teams to play smart possession hurling. Solo running is prohibited as is the scoring of points. Unfamiliarity with the rules was evident in the early games as scores were proving hard to come by. A well taken goal by Paul Fitzgerald after being set up by Jack Ralph was all that separated The Presentation from Carlow CBS in their opening game. The remaining two fixtures in the group stage pitted The Presentation against Borris Vocational School and Knockbeg College. Goals from the usual suspects Fiachra Fitzpatrick, Oisin Pagnier and Terry French ensured comfortable victories and a place in the day’s A Final. The Askea lads watched the B Final as talk began among the crowd as to who would claim the tournament’s main prize. Borris provided the opposition and gave a good account of themselves as their first touch and striking was of the highest standard. However, the lads from Mount-Leinster could not match the intensity and athleticism of a team determined to build on their recent Carlow Championship success. The excellent Lee Carpenter lead the team from mid-field to a 4:0 victory which saw sharp-shooter Paul Fitzgerald record a sublime hat-trick. The other goal coming from the stick of team captain Shane Duffy. A big talking point from the day was the performances of The Presentation’s young shot-stopper Conor Treacy as he amazingly never conceded a goal in any of the four games. He displays all the skills and bravery required for the position and is surely a future Carlow number 1. He is of course helped by his Setanta club mate David Iacob who is a commanding presence on the edge of the square. “Hell’s Kitchen” was a name given to the All-Ireland winning Tipperary full-back line of the 1960’s. Iacob and his colleagues are starting to garner a similar reputation. 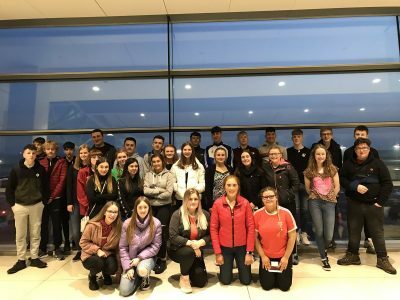 Congratulations to Doireann Broderick, Abbie Nolan, Niamh Nolan, Seán O’Driscoll and Charlie O’Meara who have been selected to represent Ireland in an International Theatre Project which culminates in a week-long workshop in Berlin next November. 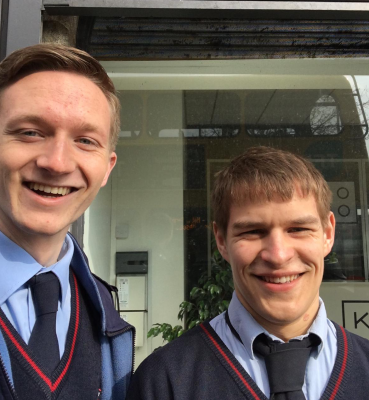 All are experienced performers with a keen interest in the German language. Combining these two areas of interest and performing in front of an audience in Berlin will no doubt be very interesting. We look forward to hearing about their adventures. 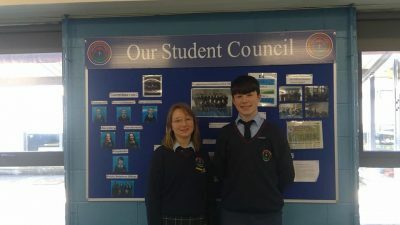 National Spring Clean – Mr Mc Dermott, Ms U. Byrne, Michael Keane, Ms Flannagan, Lily Mulcahy Ralph, Darragh Nolan, Mr Hurley, Keelan Doyle, Alex Hickey, Emily Jane Kendellon, Claudia Lopez, Ms Barrett and Shauna Murphy Woods. Photo taken by Josh Brealy who also took part in the initiative. 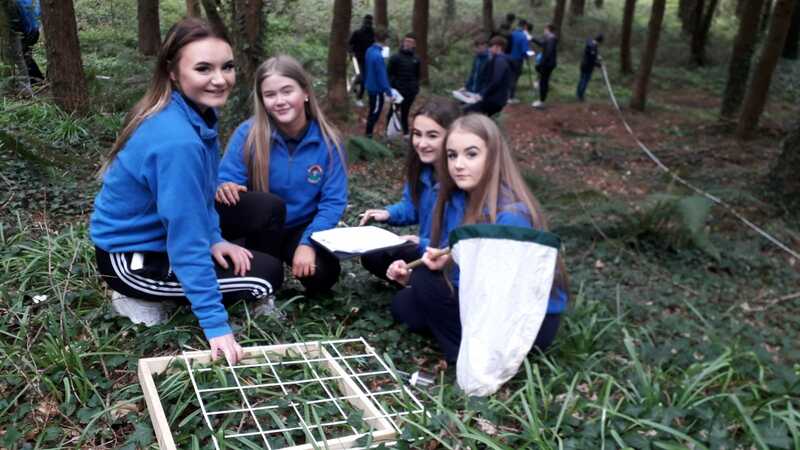 On Friday 5 April, students and staff from Presentation College got involved in the National Spring Clean initiative. 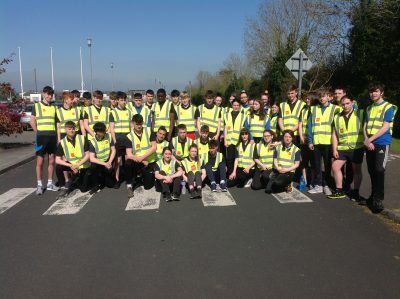 A group of Transition Year students began the day well and enjoyed the nice weather while doing some litter picking. 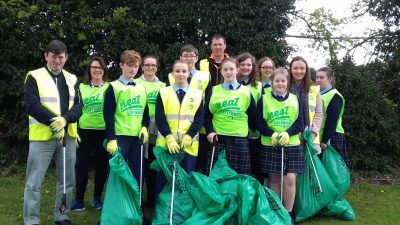 After school, an enthusiastic group of staff and teachers tackled the litter on the perimeter of the school along the N80. As can be seen in the photo, quite a bit of litter was collected in under an hour. We were delighted to wear the Neat Streets and National Spring Clean vests to raise awareness of the initiative at the beginning of the month. 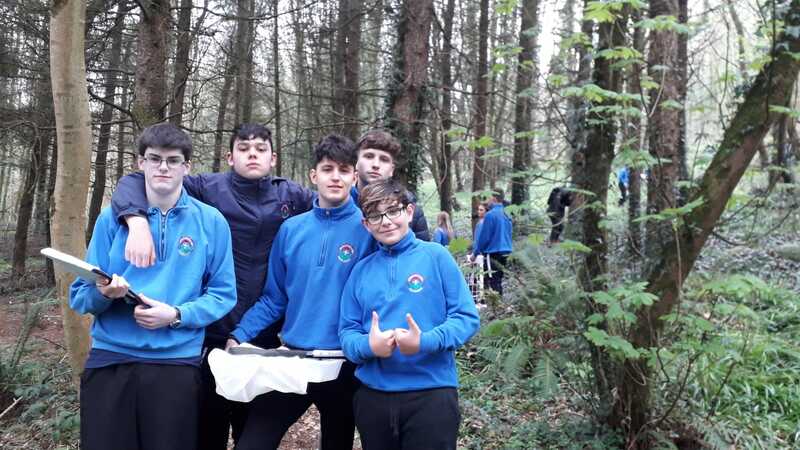 Students who stayed in after school for the N80 litterpick were: Josh Brealy, Keelan Doyle, Alex Hickey, Michael Keane, Emily Jane Kendellon, Claudia Lopez, Lily Mulcahy Ralph, Shauna Murphy Woods and the Green School Secretary – Darragh Nolan. Staff and students were encouraged by the many drivers and pedestrians passing by. We removed broken bottles, drink cans, wrappers, a bicycle seat and all sorts of plastic. On a happier note, we spotted several birds’ nests and plenty of evidence of spring around the corner. 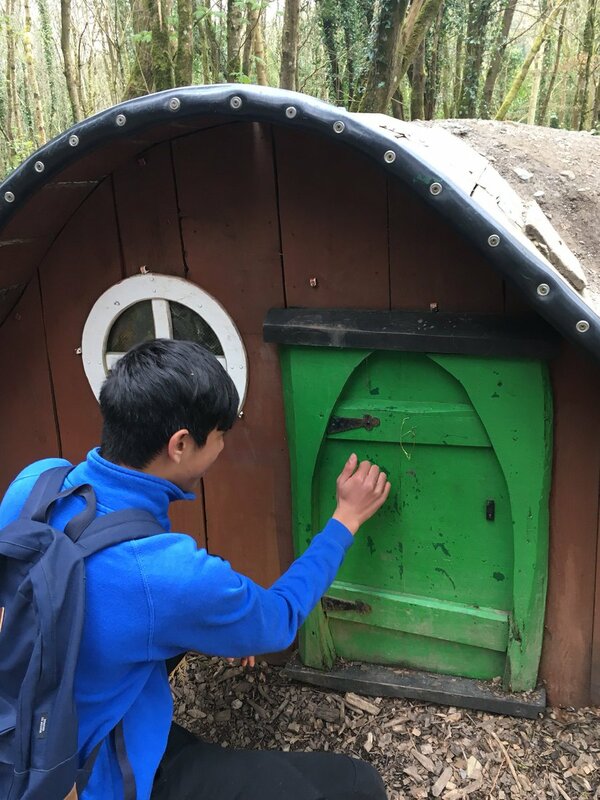 The Green Schools committee are looking forward to our raffle next week and the holidays and would like to invite any students interested in joining, to join our group on Schoolwise, to speak to one of the teachers involved or to come along to a meeting. The next meeting will be Wednesday 8 May. Rory McCann came to visit our Transition Year students during March and April. Rory’s club, 10th Planet, is a Jujitsu club based in Carlow Sports and Social Club on College Street. 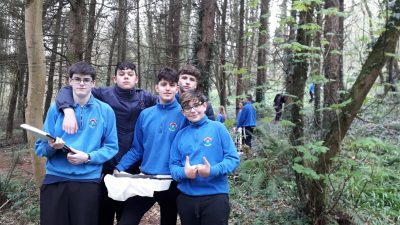 All students had a great time and left with valuable new skills. Over the past week or so, students from Presentation College have been seen running for fun. Pictured are some of our TY year group who participated in a ‘5km Fun Run’ on Friday 29 April in wonderful weather conditions. There were some excellent athletic results too. Thanks to Ms Cardiff for the update. Well done to Blessing Kingsley who scored the only goal as Ireland beat Scotland recently. We all very proud of her achievements. 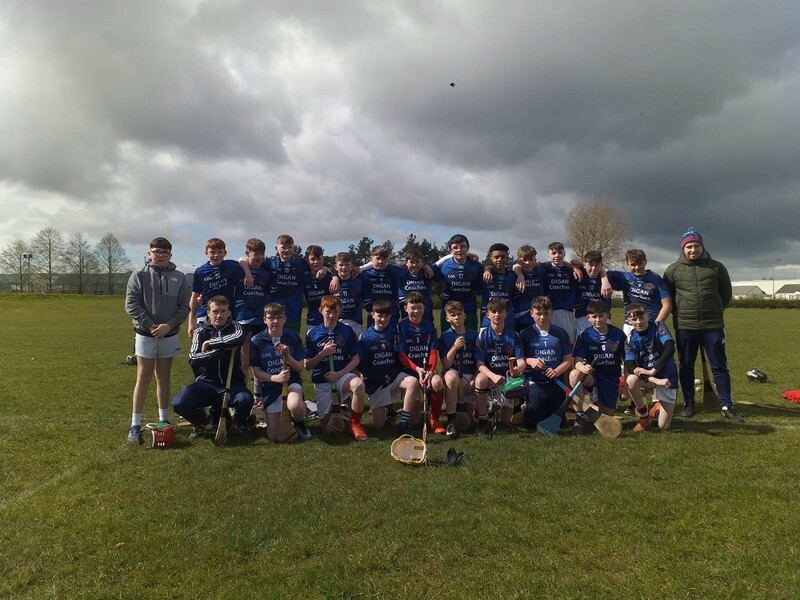 As dark clouds loomed ominously overhead, it was goals that poured in as the young hurlers from the Presentation College and the Gaelcholaiste advanced to the South Leinster Final at the expense of Scoil Dara Secondary School. 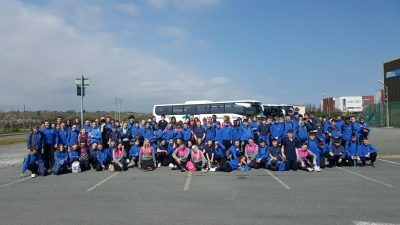 The Kilcock outfit made the long journey to Carlow town with hopes of going one-step further than last year’s campaign. However, that never looked a reality as they were out fought and out played all over the pitch from the get go. The first half was largely played inside Scoil Dara’s half of the field as they were unable to clear their lines due to the incredible work rate of the Presentation’s forwards. On the occasion when the ball did make its way up the field, David Iacob and Sean Buggy tended to rapidly send it back down where it came from. Centre-back Alex O’Dubhslaine also had an excellent afternoon marshalling the defence. The first of the day’s scores came from the stick of Conal Fitzpatrick and was quickly followed up by an Oisin Pagnier point after one of his trade mark solo runs. Goal chances would soon present themselves and Terry French was on hand strike to the net on two occasions in the first half. A third major before the whistle from Jack Ralph left the score-line 3.5 to 0.1 at the interval. The mountain only got bigger for Scoil Dara on the restart as Terry French completed his hat-trick and substitute Paul Grey bagged a brace to ensure there would be no fairy-tale come-back. Further scores from the excellent Shane Duffy, Fitzpatrick and Pagnier saw the Pres run out commanding winners on a score-line of 10.7 to 1.1. Attention now turns to the South-Leinster Final where the Carlow outfit are likely to meet strong opposition as they await the winners of the other semi-final which will be contested next week by the Wexford and Kilkenny champions. They should have nothing to fear however, as they are a team on a roll whose high energy brand of hurling will no doubt be a match for anyone. Presentation/Gaelcholaiste Team. (All players are from Presentaion College unless stated). Conor Treacy, 2. Andre Carvalho, 3. David Iacob. 4. Aaron Shanahan. 5. Sean Buggy. 6. Alex Ó Dubhshlaine (GC) 7. Sean Ó Beacháin (GC). 8. Shane Duffy. 9. Oisín Pagnier. 10. Paul Fitzgerald. 11. Conal Fitzpatrick (GC). 12. Ross Ó Hanluain (GC). 13. Terry French. 14. Jack Ralph. 15. John Ó Caidhin (GC) 16. Mickey Maher. 17. Paul Grey. 19. Cian Ó Gormain (GC). 20. Andrew Vint (GC). 21. Cian Ó Riabaigh (GC). 22. Jay Barcoe. 23. Tristan Mac an Tsaoi (GC). 24. Jonah Webb (GC). 25. James Cranny. In keeping with the Department of Education and Skills’ vision of encouraging innovation and promoting excellence in leadership, the Centre for School Leadership (CSL) invited schools to participate in a pilot scheme designed to support projects that involve innovative approaches to school leadership and management. 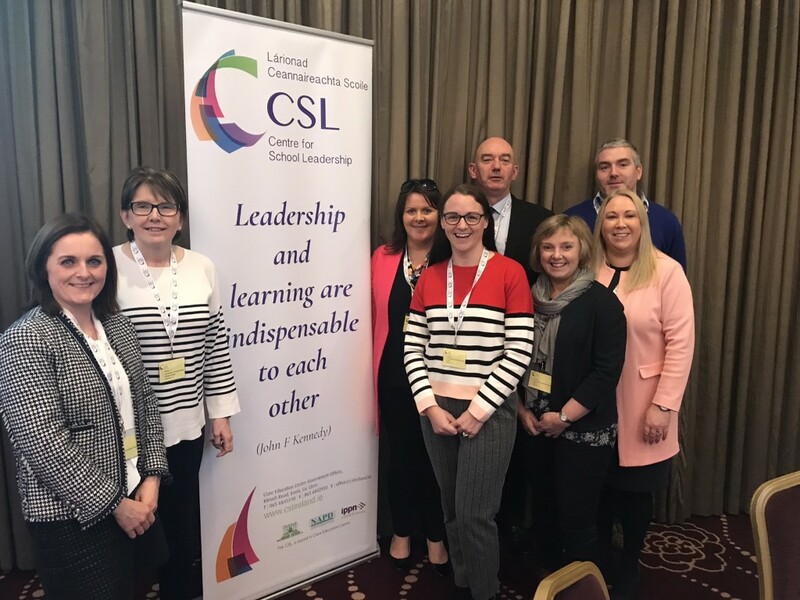 Presentation College as lead school on the CSL project will collaborate with Coláiste Eoin and Tyndall College. 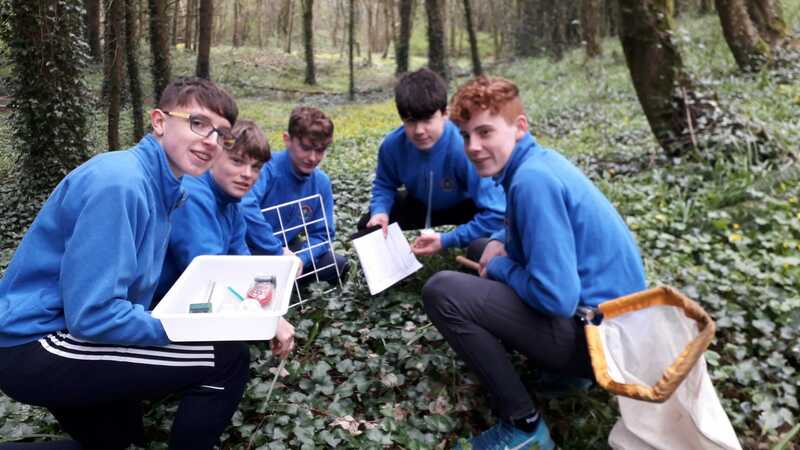 Four teachers from each school will work collaboratively with the Director of the Co. Wexford Education Centre, Ms Lorraine O’Gorman, and the Cluster Facilitator from CSL, Ms Detta Cahill, over a fifteen-month period to embed active learning methodologies in their classrooms. Cluster participants will also share best practice with colleagues in their respective schools and conduct collaborative planning sessions through inter-school peer observations. Upon conclusion of the project, there will be a report and a showcase of the project presented. The main aim of undertaking this project is to increase student engagement levels in our classrooms and encourage distributed leadership among staff. 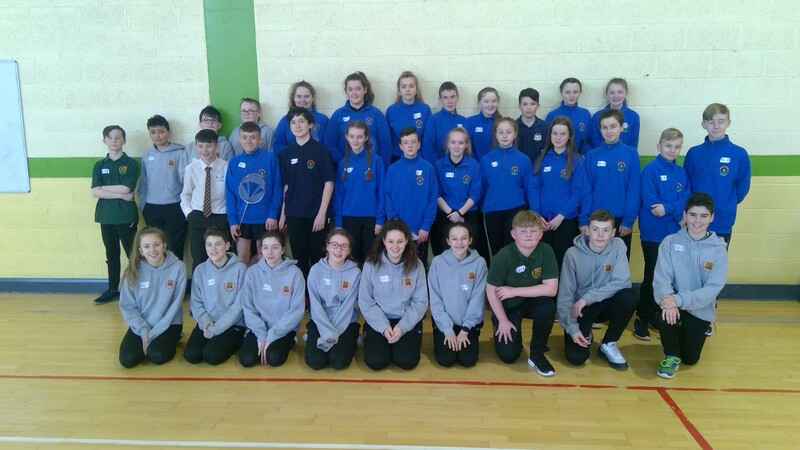 Presentation College hosted Gaelcoláiste Cheatharlach in what is becoming an annual badminton outing between both schools. 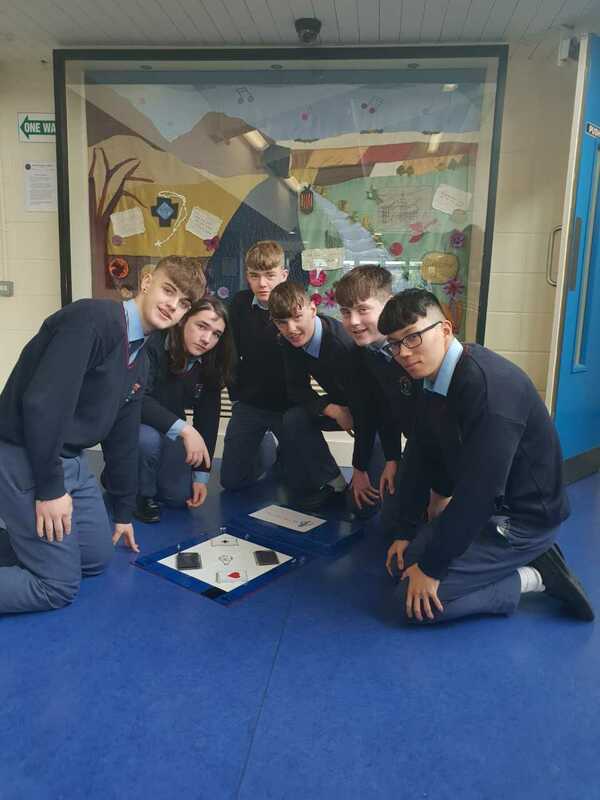 First and Second year students played a round robin style tournament in doubles matches and we were lucky enough to come out on top having won more games than our neighbours. 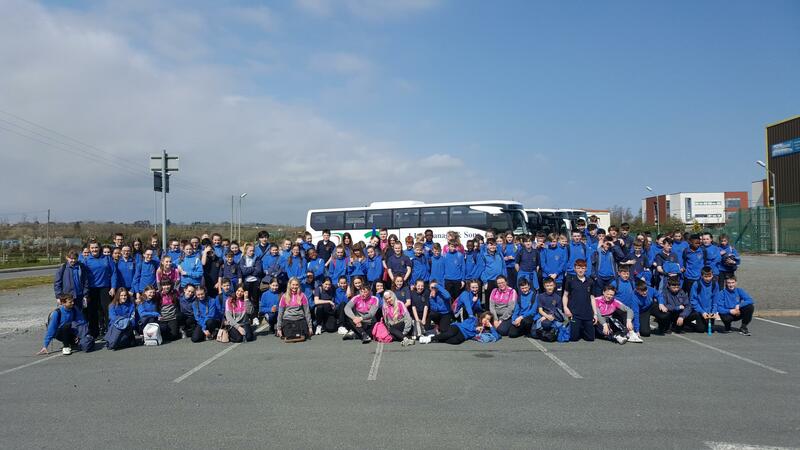 All students played to an excellent standard and equally had a really enjoyable time on a day that was as much a social outing as a competitive one. Congratulations to all involved including the students who helped run the event and teachers Ms Cardiff and Ms Malone who are over Badminton in Presentation College. Last week thirty-two Geography students along with four teachers travelled to Italy. 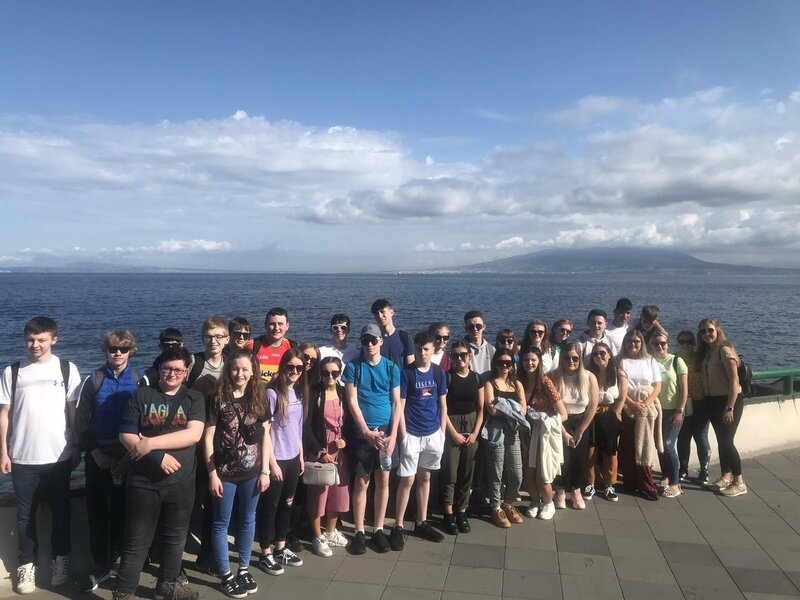 They visited Rome, Sorento, Capri and Naples. One of the highlights was exploring Pompeii. We are delighted to welcome our new Vice-Chairperson Natalia Sluzel and our new Chairperson Seán O’Driscoll. 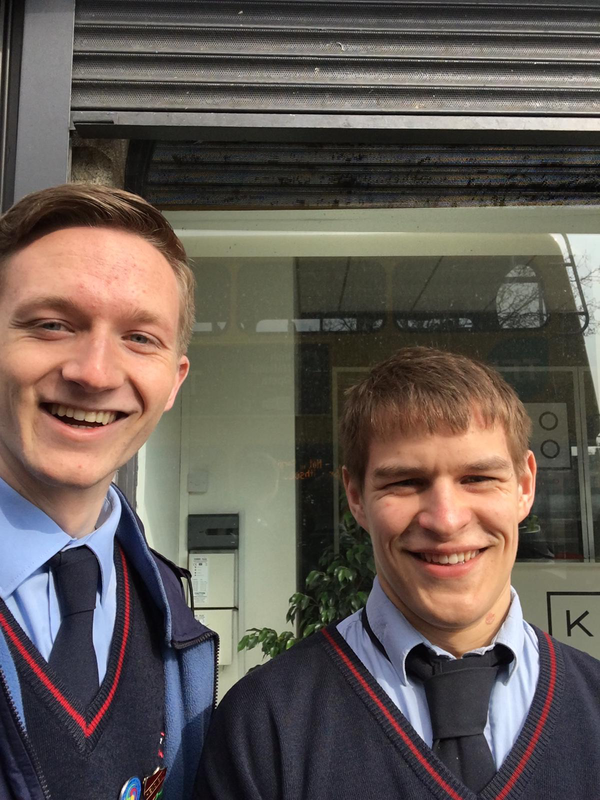 We are sorry to see our old Chairperson and Vice-Chairperson Daniel and Kirill step down and would like to thank them for their leadership and service to the school. 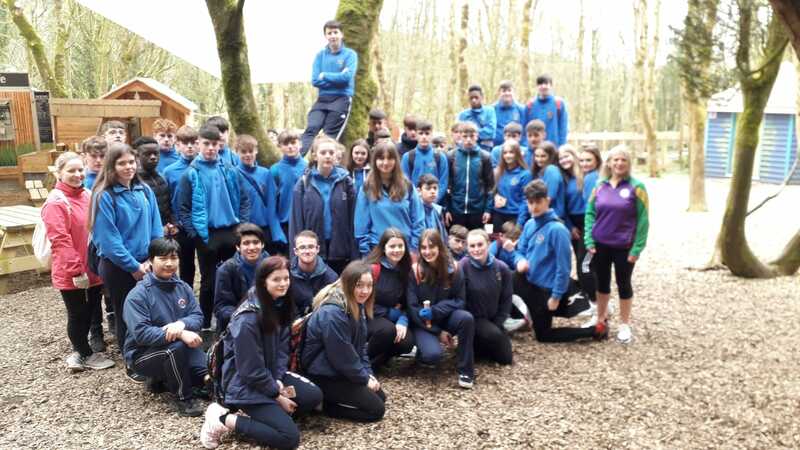 Third Years had a fantastic day discovering and learning just before the Easter Holidays when they were brought by Ms Kinsella and Ms Brennan to Castlecomer Discovery Park. They conducted experiments and had a lovely day as can be seen from the photos.